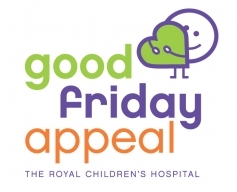 Good Friday Appeal is the official charity organising the Royal Children's Hospital's Good Friday Appeal event broadcast on Channel Seven. The Good Friday Appeal is a unique fundraising activity that brings together people from all parts of the community in a very special way. The common goal is to raise money for The Royal Children's Hospital, Melbourne. The Appeal's strength lies in the thousands of volunteers who give of their time, expertise and creativity to ensure that events are successful and the rewards are great. The Good Friday Appeal was started in 1931 when a group of sportsmen and journalists from the Herald & Weekly Times' publication The Sporting Globe organised a sporting carnival in aid of charity; the Children's Hospital was nominated as a recipient of the funds. In 1942, the Managing Director of The Herald agreed that The Herald and radio station 3DB should promote an annual Appeal on Good Friday. In 1957, Channel 7 joined the Appeal and began the first day-long telethon, which continues each year at Etihad Stadium. Channel Seven Melbourne and The Herald and Weekly Times have remained major supporters of the Good Friday Appeal and in recent years, 3AW 693 and Magic 1278 have become official radio supporters. The Good Friday Appeal is known for the fun, enthusiasm and ingenuity of those involved. The Appeal is a non-political, non-denominational organisation that exists solely to financially support The Royal Children's Hospital, Melbourne. The Appeal continues to be managed by staff of the Herald & Weekly Times. Appeal phone number is only answered on Good Friday. If you wish to make a donation during the year, call (03) 9292 1166. If your business or workplace would like to collect for the The Royal Children's Hospital Good Friday Appeal by keeping one of our collection containers please contact our office. Royal Children's Hospital Good Friday Appeal Online Auction is live and has something for everyone and every budget!.